Our service level target is to answer 95 per cent of 9-1-1 calls in five seconds or less. To the end of November, our service level is 98 per cent. 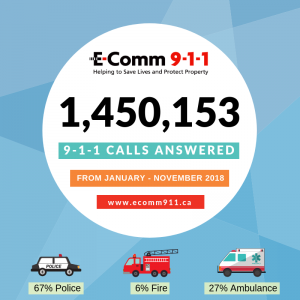 The total number of 9-1-1 calls are for E-Comm’s service area: 26 regional districts and communities spanning from Vancouver Island to Alberta and from the U.S. borders to north of Prince George. We also received a total of 40 Text with 9-1-1 (T9-1-1) calls so far in 2018. T9-1-1 is a specialized texting service available for people who are Deaf/Deaf-Blind, Hard-of Hearing or Speech Impaired (DHHSI) that allows registered users to communicate with 9-1-1 call-takers through text. Find out more about T9-1-1.